This is one I hear ALL THE TIME. People love to say 'oh but too many bananas will make you gain weight!' when I'm discussing diet/food choices with them. It makes me laugh each time. This fruit gets a bad rap due to supplying about half its calories from carbohydrates. Yes, bananas have carbs & sugar; 14g of sugar for your average sized banana. Sugar is something most of us should work towards limiting in the diet. However, bananas have natural sugar and that sugar is paired with naturally occurring fiber to create a balance that's good for your body. A banana also contains roughly 100 calories and is pretty satisfying to the appetite. 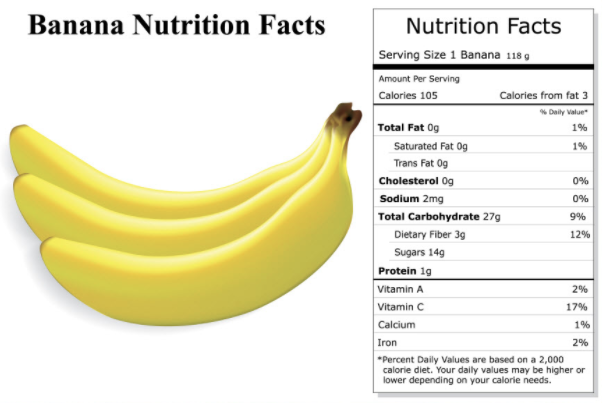 Beyond supplying carbs, sugar, and fiber, bananas also provide potassium, B6, manganese, and vitamin C. Need more info? Read this related article. Besides being nutritionally dense, bananas are very versatile! Grab one for a snack. Cut one up in your yogurt bowl. Add slices to a BPJ. Bake it for a naturally sweet dessert. Bake it into bread. Blend one into a smoothie. Blend a frozen into 'nice' cream. Bananas are very easy on the gut which makes them an ideal option for fueling workouts or during time of GI distress/illness. Despite all this, people still love to claim bananas will make them fat. Can you not list any food you've consumed in the past week that is more likely to be hindering your weight loss progress more than a banana? Seriously. Chocolate chips? Ice cream, a pastry, a 'coffee' drink, a soda, take-out, a couple cocktails, excessive crackers/ cheese/ processed cereal/ processed meats... you get the idea. In all my years of dietary counseling, I have yet to see a client whose true problem was 'weight gain due to banana consumption'. There is ALWAYS a more pressing issue. Do not blame the banana. Trying to work on your nutrition?